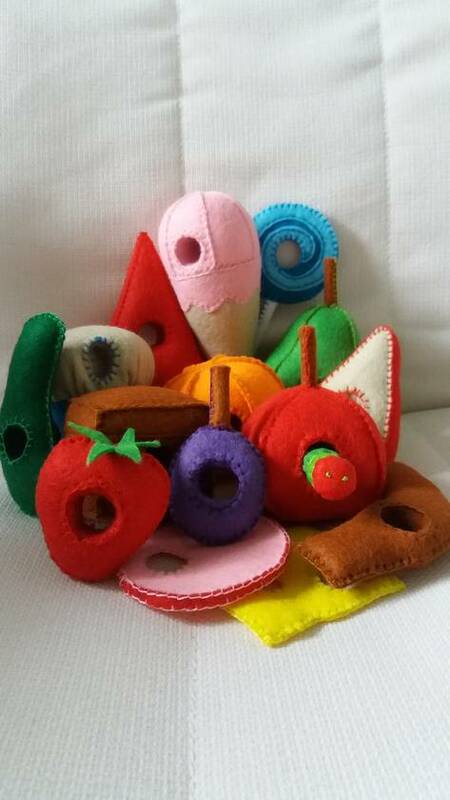 Handmade hand stitch wool felt props for the 'Very Hungry Caterpillar' story. This set includes everything it needs for the Hungry Caterpillar story below. The story goes like this 'On Monday he ate through one apple, On Tuesday he ate through two pears, On Wednesday he ate through three plums, On Thursday he ate through four strawberries, On Friday he ate through five oranges, On Saturday he ate through one piece of chocolate cake, One ice-cream cone, One pickle, One slice of Swiss cheese, One slice of salami, One lollipop, One piece of cherry pie, One sausage, One cupcake, And one slice of watermelon. This set makes a great resource for kindergartens and daycares. Children will love playing with this set.